The Fever Tree by Jennifer McVeigh. Publisher: Berkley Trade Reprint (February 4, 2014). Historical fiction. paperback. 437 pages. ISBN 978-0-425-26491-1. Frances Irvine, left destitute after her father’s death must choose between living like a servant to her aunt or marrying Dr. Edwin Matthews and moving to South Africa. She chooses marriage and embarks on a journey to a country she knows little about and to a relationship with a man she neither loves nor even likes [“She was intrigued by Africa. It could offer her a fresh start. . . The problem was she didn’t think she would ever come to like him. He was too serious. Always analyzing everything until he had squeezed all the joy out of it. When she was with him she felt he expected something from her, a kind of moral rectitude to match his own.”] Perhaps Frances, an only child, the only daughter, lived a sheltered life in England. Unfortunately women had few options at the time– a trade, fortune or a marriage. During the long voyage she meets other women on the ship who are part of England’s emigration project—shipping out women to work in the colonies as nurses or domestics. She establishes a fascinating alliance with two women, Anne and Mariella, part of the emigration society. Why both women decided to leave England and what they plan to do once they settle in South Africa could be a novel on its own. Anne will become a nurse at hospital. Frances meets the sleazy William Westbrook and the novel swings into romance mode for a tedious time while Frances becomes smitten with this deceptive man and risks her reputation over him. She thinks of little else than Westbrook for the voyage. Frances doesn’t know herself enough to understand humanity, the big picture and her own foolish ideals for love. An insecure, inexperienced young woman she’s bound to make mistakes and fall for unsavory characters. I’d hoped that it wouldn’t be written so predictably and romantic novel-esque at times, however. Edwin’s focused on smallpox eradication during this time of colonization, diamond-mining and mass exploitation of Africans during the 1880s. No one believes him. People think he’s trying to shut down the diamond business. Frances confuses loyalty to her husband, lust for Wesbrook, love and adoration. Debut author Jennifer McVeigh chose a compelling topic based in fact. In the author’s note she says she came upon a doctor’s diary about a smallpox epidemic which destroyed the diamond-mining town of Kimberley and how Cecil Rhodes—of Rhodes Scholarship fame—covered it up to protect his own investments. Vivid, scenic descriptions and a solid story only get mired by too much of the silly romance. A bit of parsing would’ve done nicely. 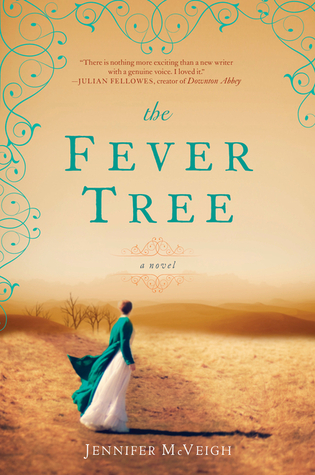 Berkley Trade Reprint has offered to send one of my readers with a valid U.S. Mailing address a copy of The Fever Tree. To enter, please include your email address in the comment section and I will select one winner on March 1. I’ll email you for your mailing address. The publisher will then mail out a copy of the novel to you. This entry was posted on February 15, 2014, 02:10 and is filed under Books. You can follow any responses to this entry through RSS 2.0. Both comments and pings are currently closed.